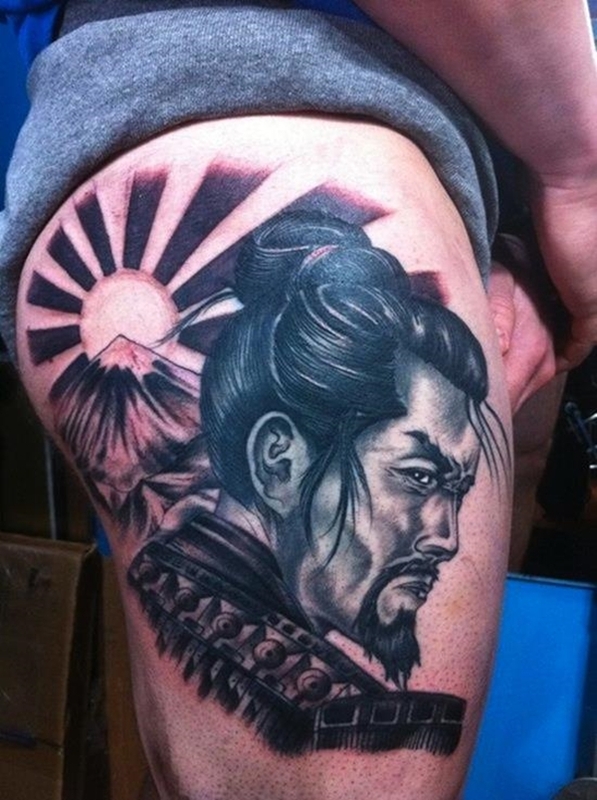 Today, without any doubt we can say that samurai’s have become a principal part of the Japanese tattoo world. 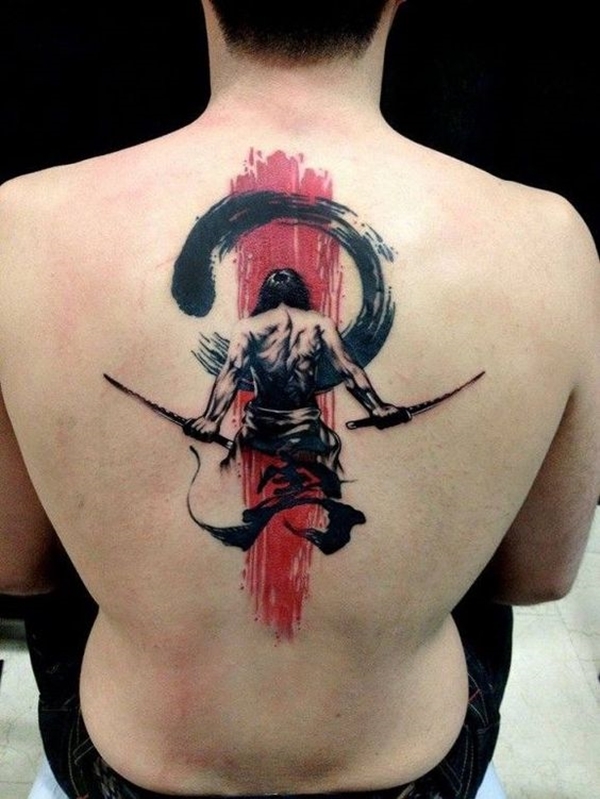 Now, you must be wondering who are Samurai’s? 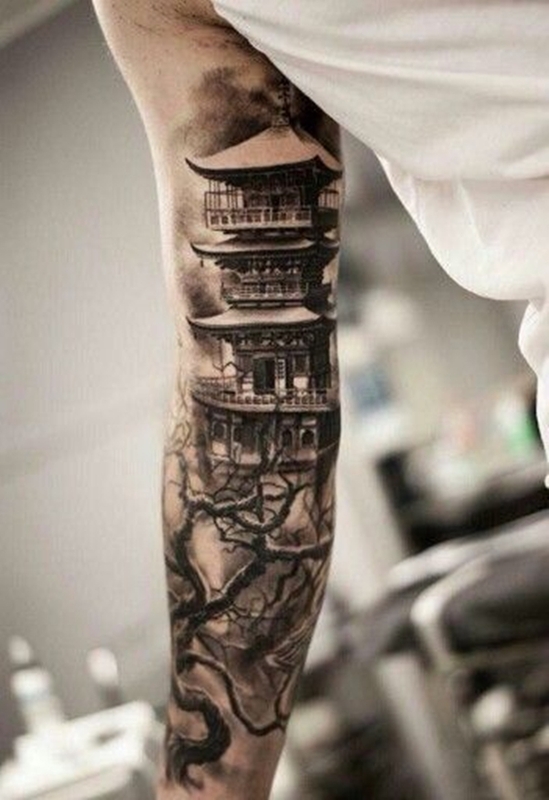 Why they hold an indeed important place in traditional Japanese tattoo designs? 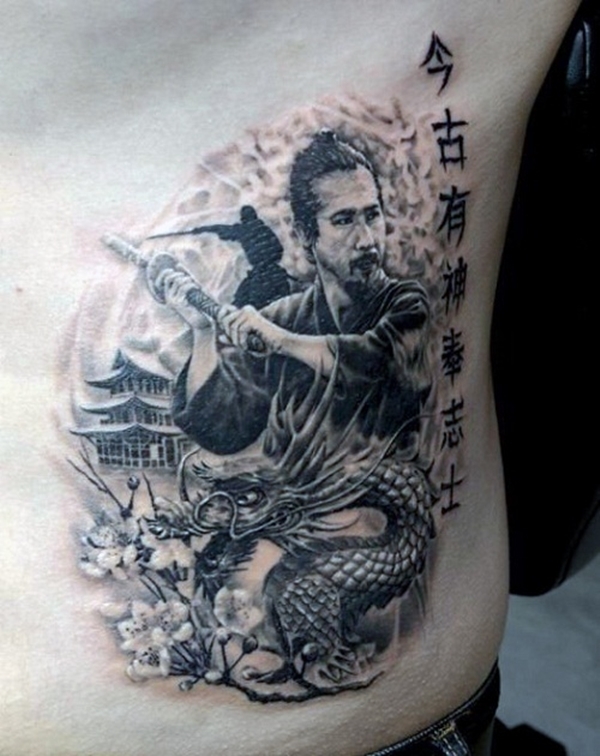 Let us tell you – Samurai are a class of highly disciplined, courageous and well-trained warriors excelled in martial arts. But, you would be surprised to know that they are extremely sensitive as human beings. 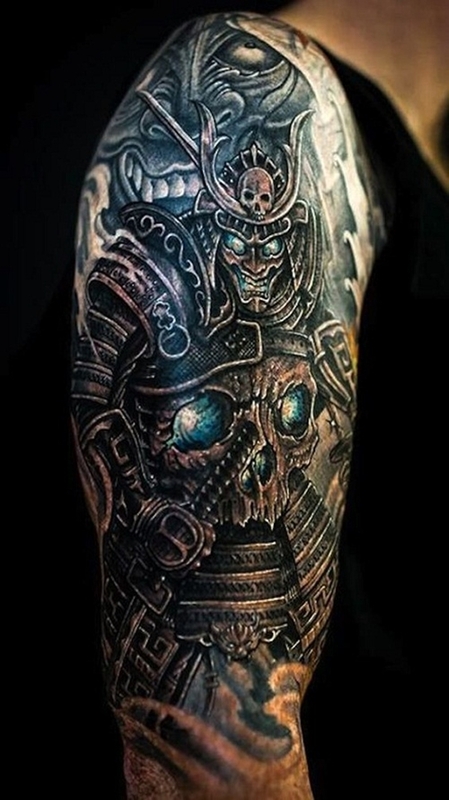 Samurai tattoos are mainly engraved by men, but that doesn’t mean women can’t have it, Samurai warrior tattoo designs are strong enemy fighters. They face difficulties and danger by fighting even a giant animal such as – dragon, octopus, fish, etc. Tattoo artists! 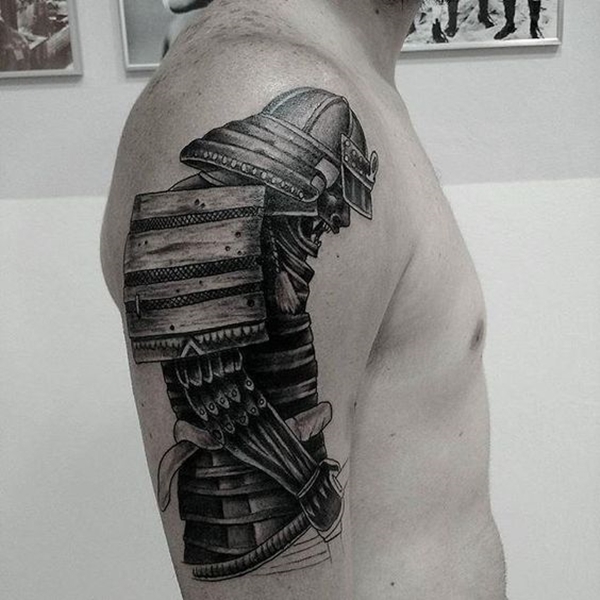 Don’t you dare forget to add armor to intricate samurai designs? Armors are extremely important to show power and to scare the enemies. 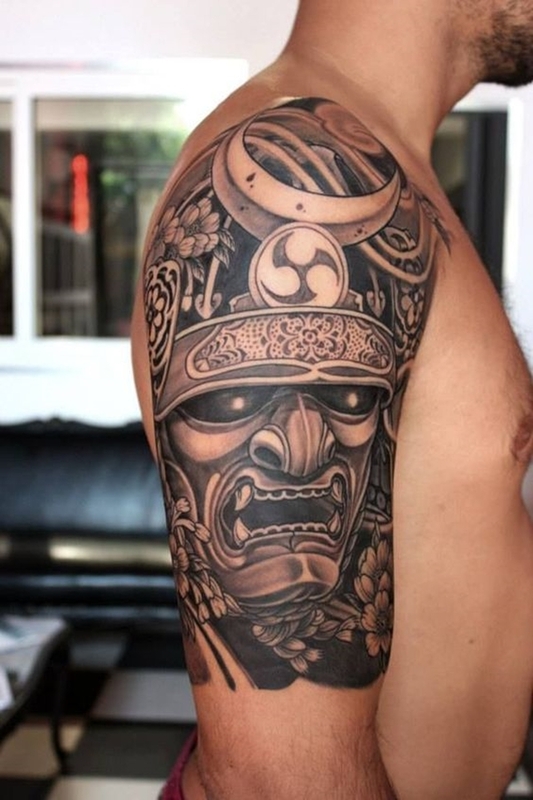 This is the only reason, you may find some scary marks, skulls or impressive helmets pattern included in many of samurai tattoo ideas. 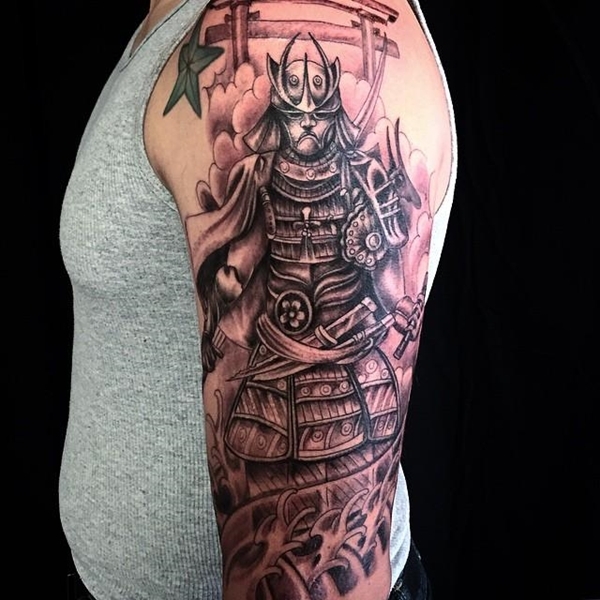 Previously, samurai warrior tattoo designs were only chosen by men and women to show love towards Japanese culture, but now with the changing times or a huge generation gap. 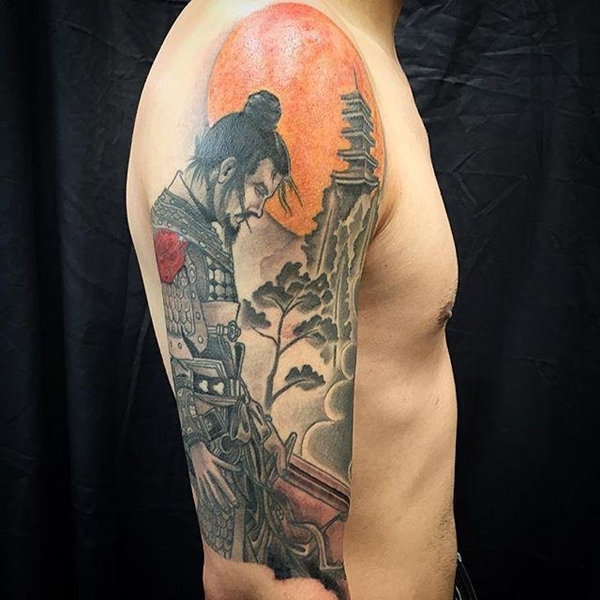 Thinking of the people became broad and they started reflecting the respect towards traditions and values of the Japanese families in their ultimate tattoo designs. 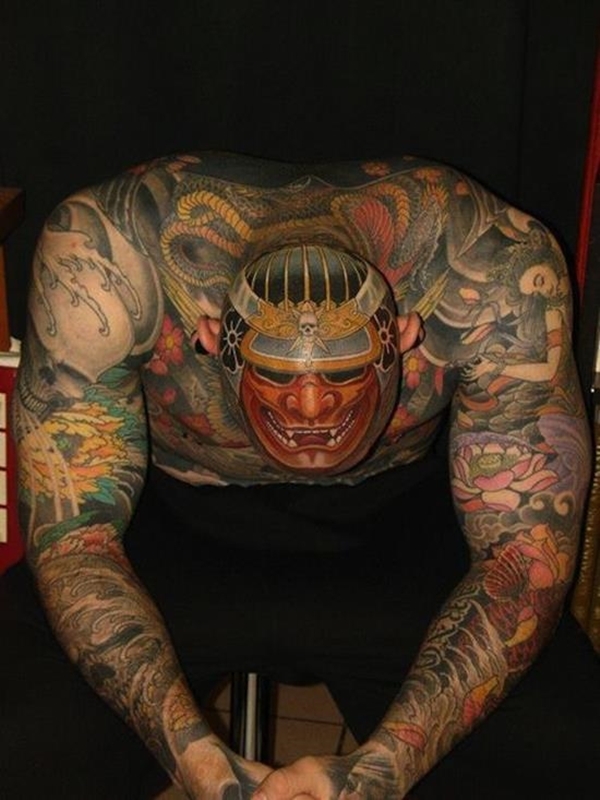 The best positive feature about these tattoos is that they have become quite a big rage not only in Japan, but are also appreciated by people belonging to other major parts of the world for their grace and honor. 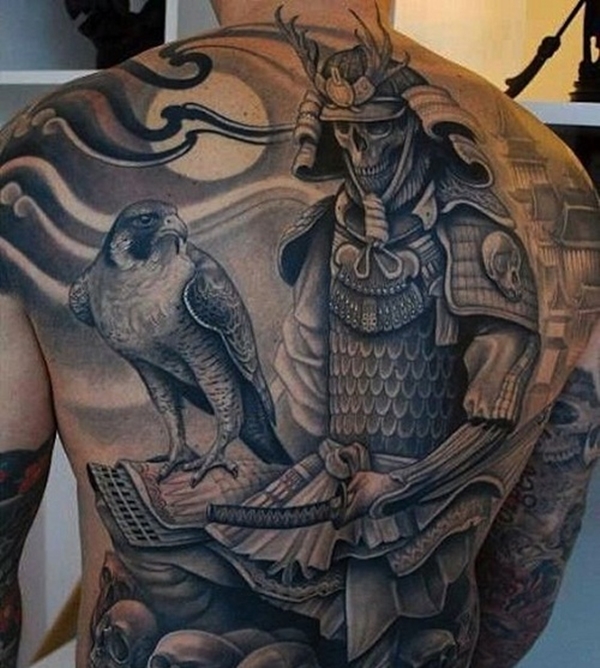 If you are a big fan of Japanese traditional tattoo art, we present unique samurai tattoos for you! 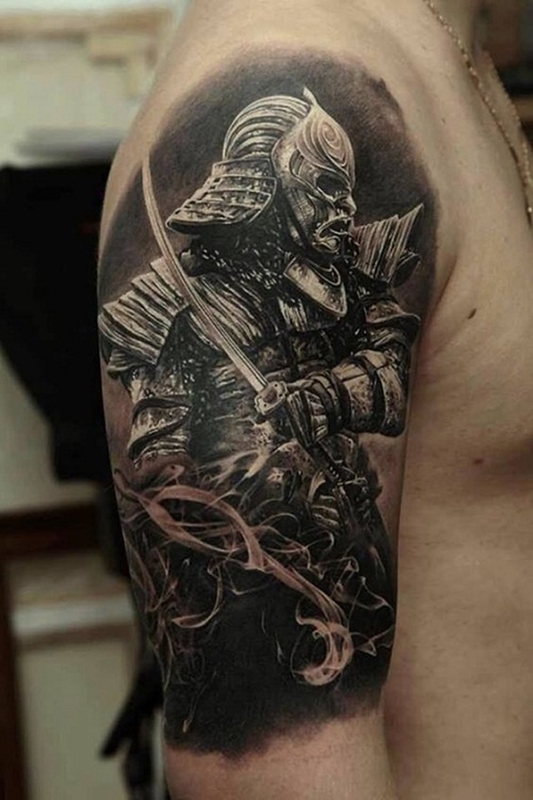 What could you expect from a samurai tattoo? It’s all about true masterpiece, isn’t it! This gorgeous design’s entire beauty lies in the beauty personified eyes that you see through mask. The design is simple – samurai is dressed in its armor in an elegant way with his/her eyes peeking out the slow opening in its helmet. The eyes expressing the inner feelings are worth to see. 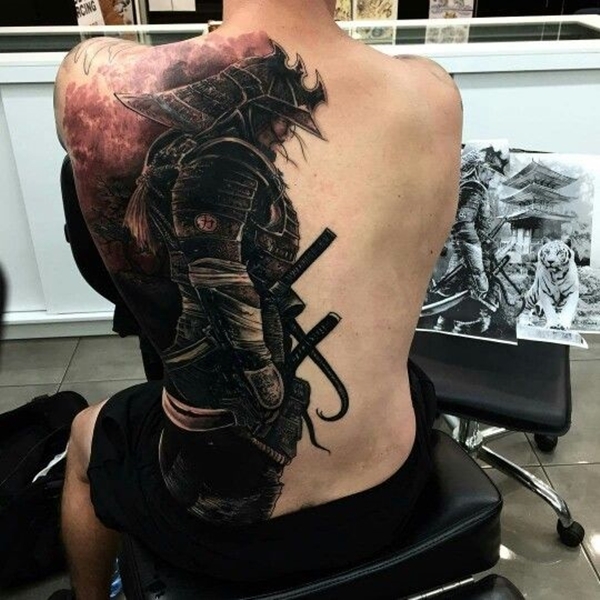 Samurai Tattoo Lovers! 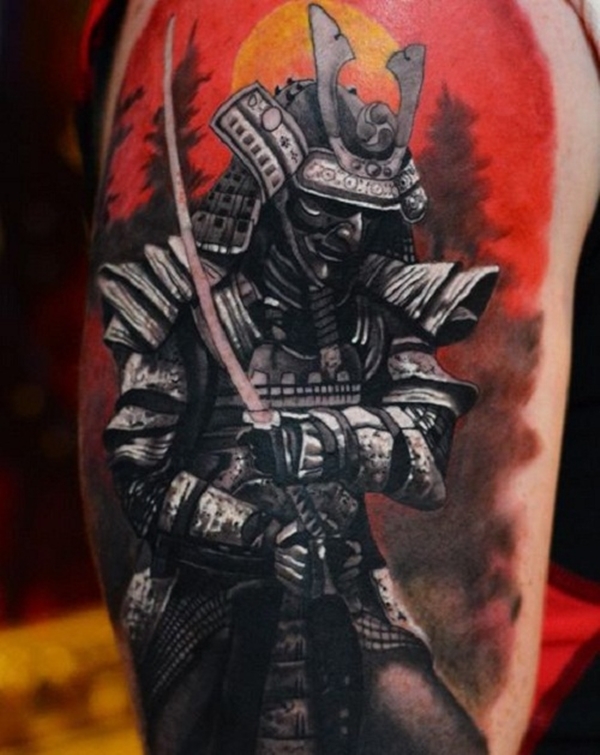 You would be really amazed with the high level of detailing, vivid colors and dynamics used in one of these excellent samurai warrior tattoo designs. 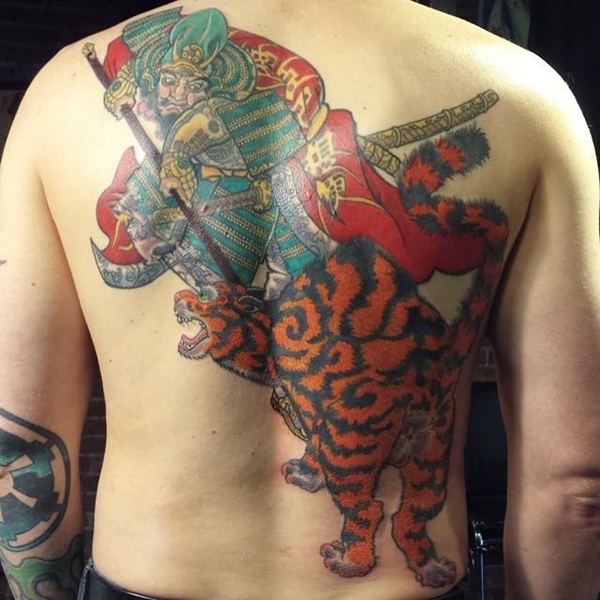 The size of the tattoo tends to be larger. 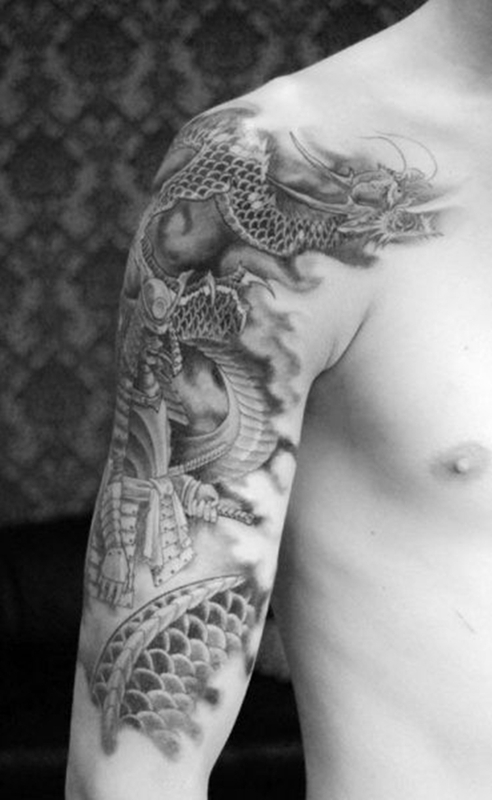 A Japanese Dragon with a samurai warrior symbolizes the quality of strength and bravery. 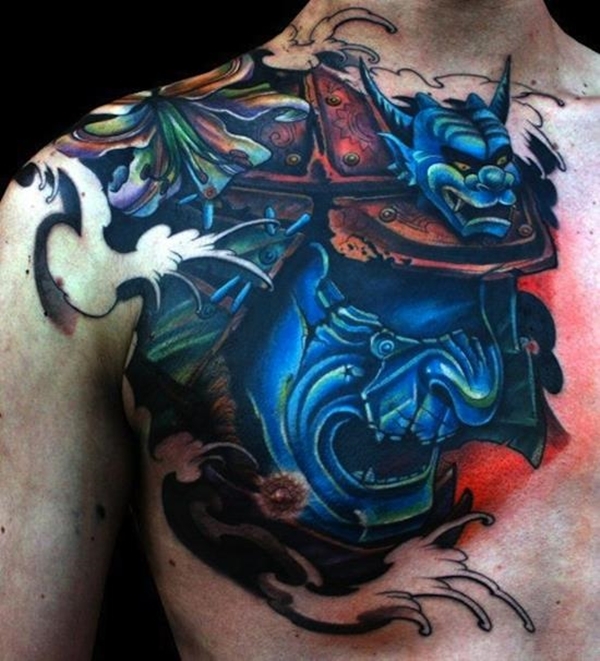 Moreover, the Japanese dragon aggravates the depth of the message that the tattoo portrays. 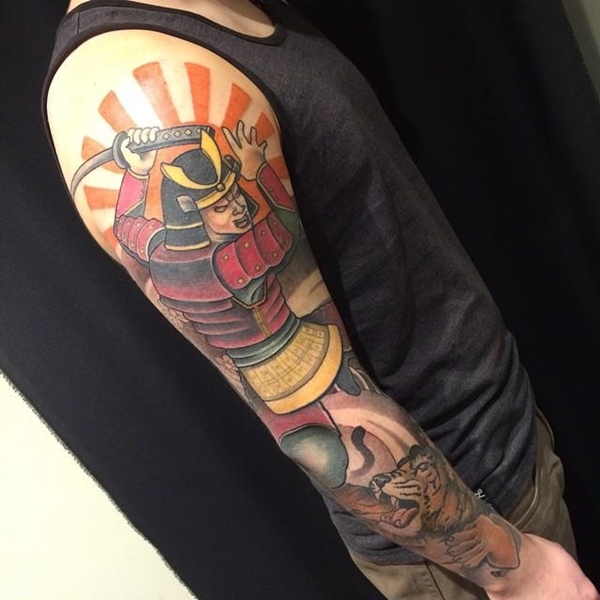 ‘Rich history and cultural value’ – these two phrases are enough to explain the symbolic importance the samurai tattoos hold over the years. 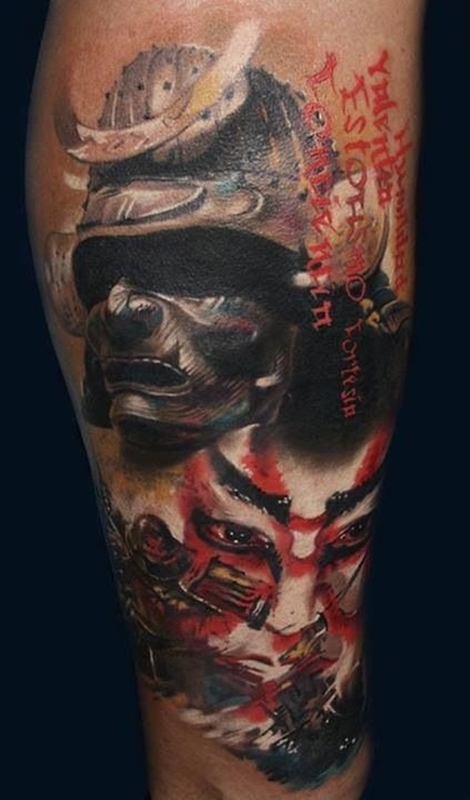 A samurai warrior tattoo with a message written in the form of Japanese writing, i.e. 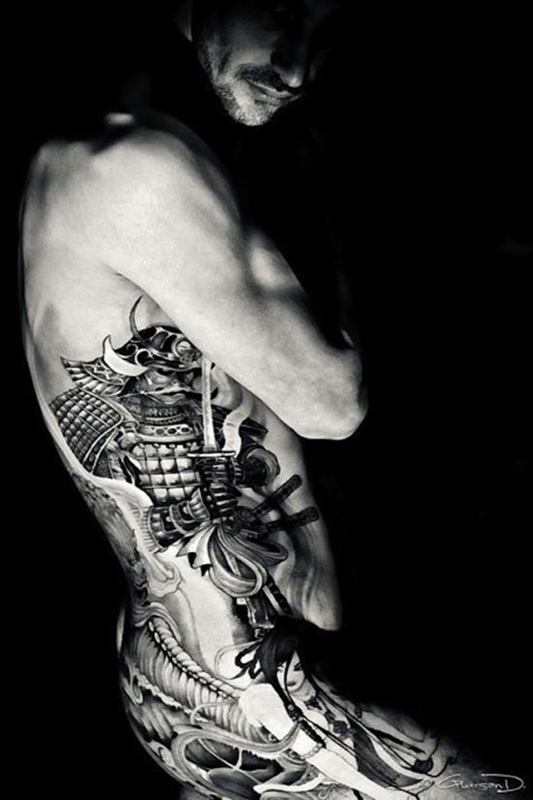 Kanji, is an excellent way to attract others eyes towards your tattoo art. 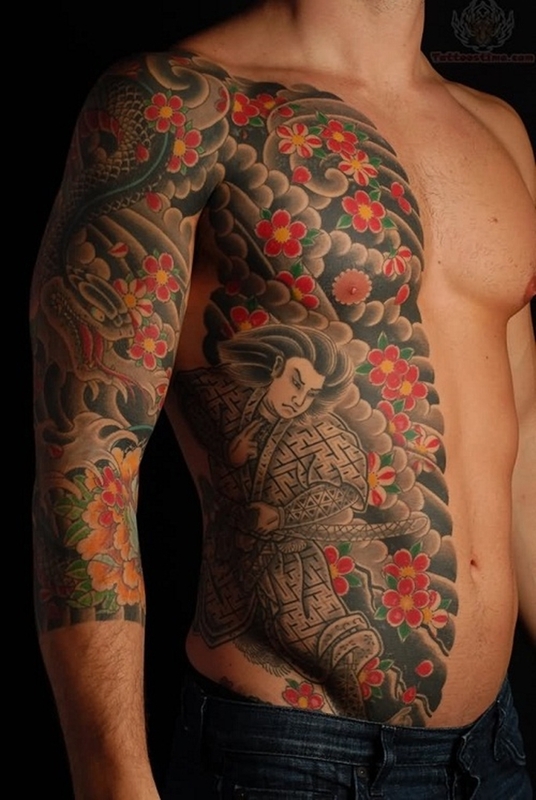 The tattoo looks best upon on biceps because it requires larger space. 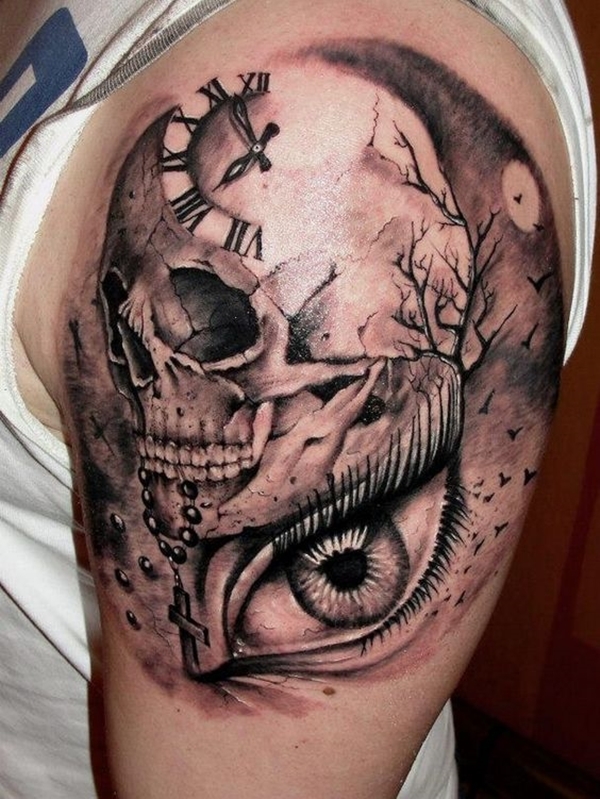 The tattoo artists are a big fan of this design. Through this, they want to reflect the power and action side of the samurais. 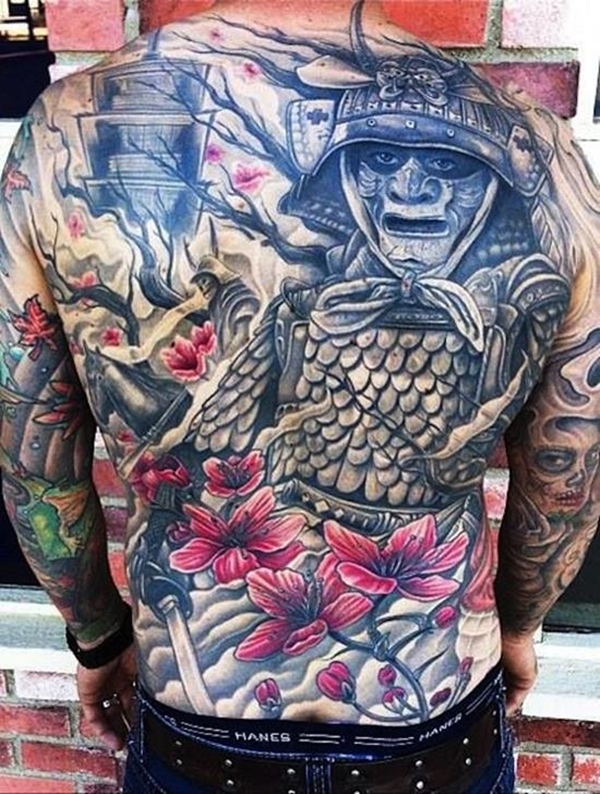 Due to this concern and stunning detailed outline of the tattoo, they rank among bold samurai warrior tattoo designs and are meant to be worn on the lower back side of the body. 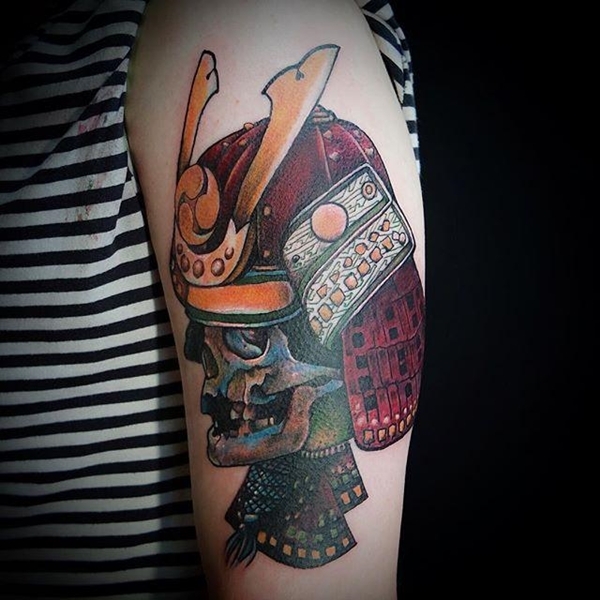 Are you looking for a unique samurai design? Then, this one is indeed special and different. 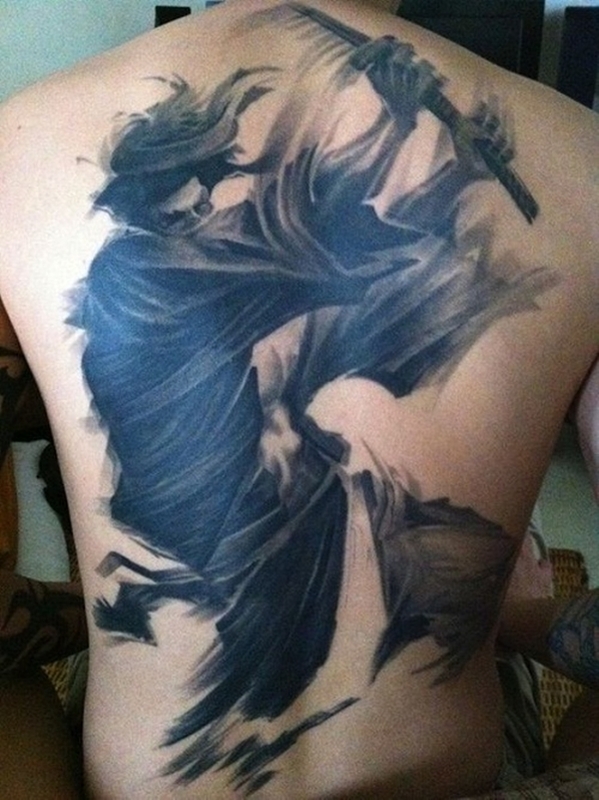 Man, usually opt for samurai ghost tattoo design to show their masculinity. Samurais were considered to be noble warriors whose mission is to serve for the betterment of the higher ranking people in the society. 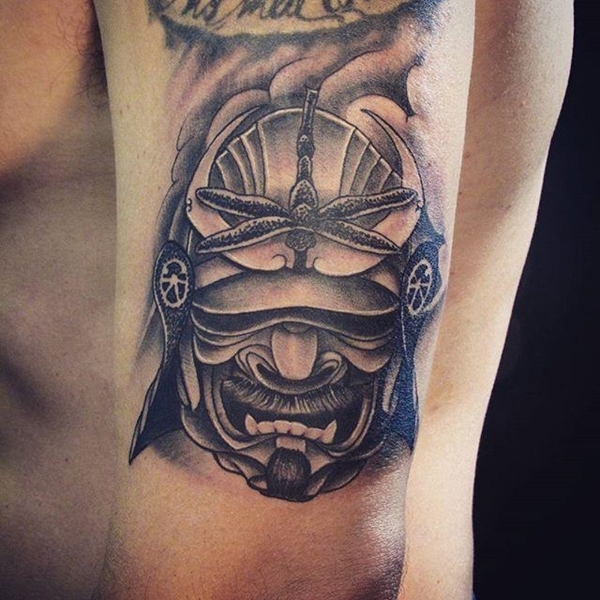 The GHOST SAMURAI design is used to scare rivals considered as obstacle in the progress of the higher people. ‘Skulls are weird and scary to look upon’, aren’t they! 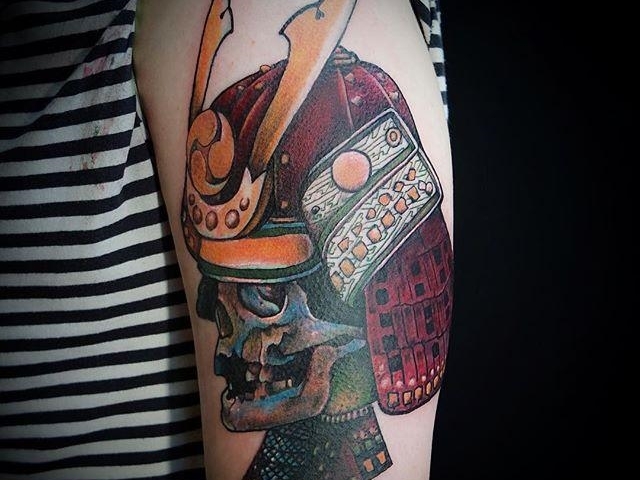 Skull samurai designs are among typical samurai warrior tattoo designs which look cool and convey the message of courage and power too with great emphasis. 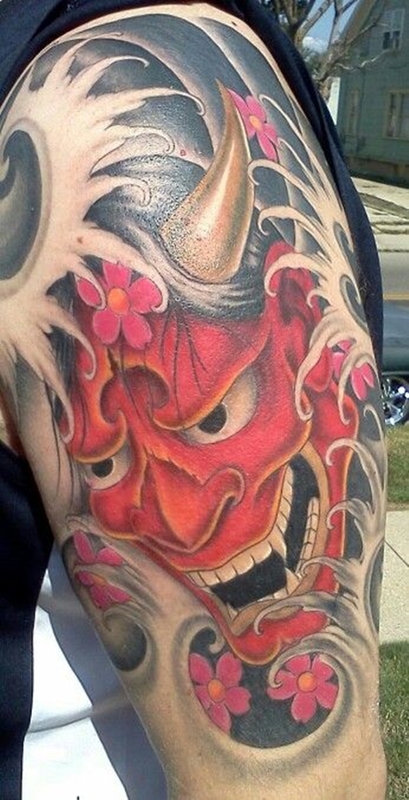 Use of bright colors makes the tattoo look fabulous on forearm. 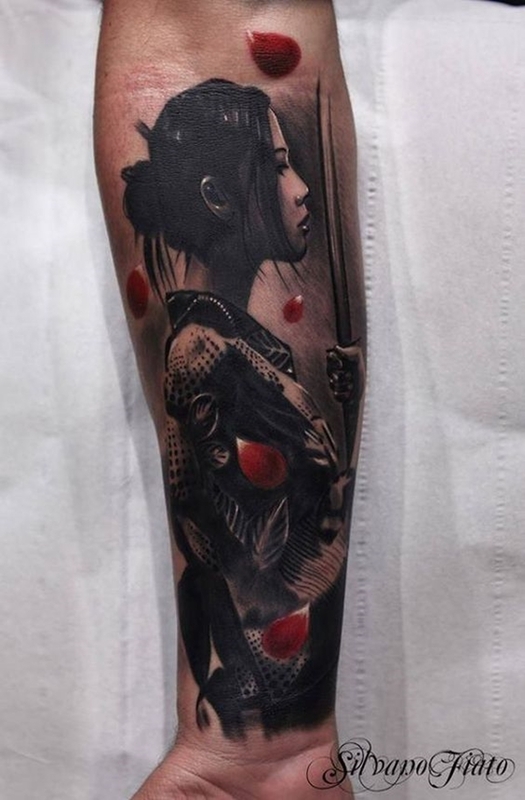 You may usually find samurai tattoos at back, but they even look absolutely stunning on half sleeves. Guys! 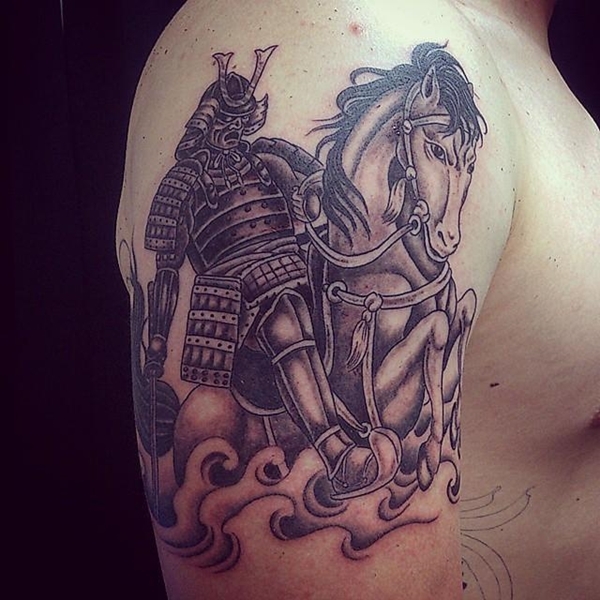 If you are looking for a tattoo that speaks up for you, then a samurai soldier in full action is an excellent choice to be made. 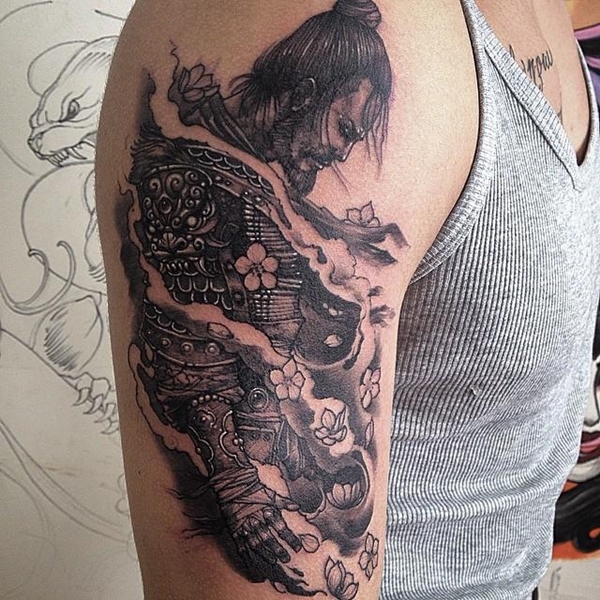 You can embellish such samurai warrior tattoo designs with other design components such as – dust flying in the wind or blood. 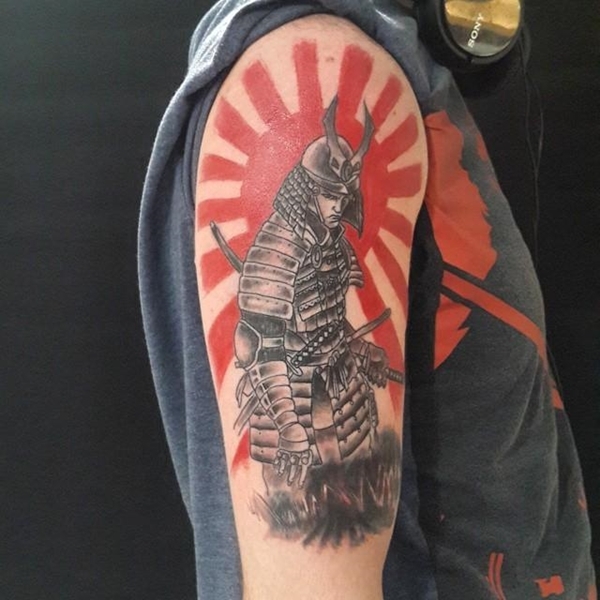 Aren’t you all curious to know why the samurai’s face is red? Is he furious? Yeah…Undoubtedly, it proves to be a SCARY IMAGE. A samurai soldier with a face bursting in red reveals anger and looks mind-blowing. 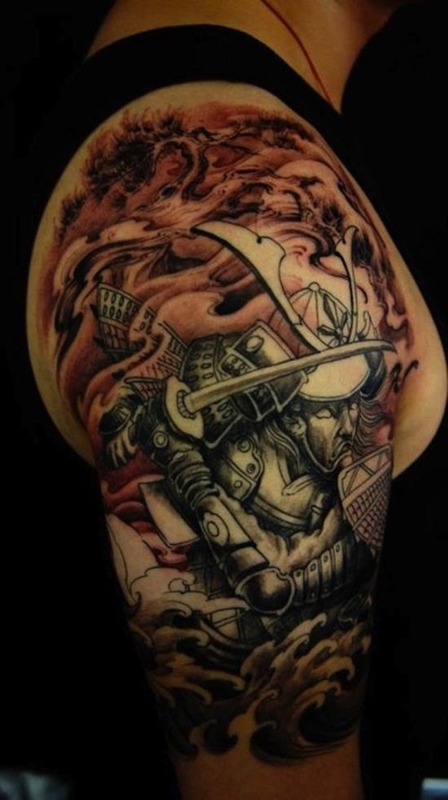 We assure you – these samurai warrior tattoo designs would remind you to live your life to the fullest. 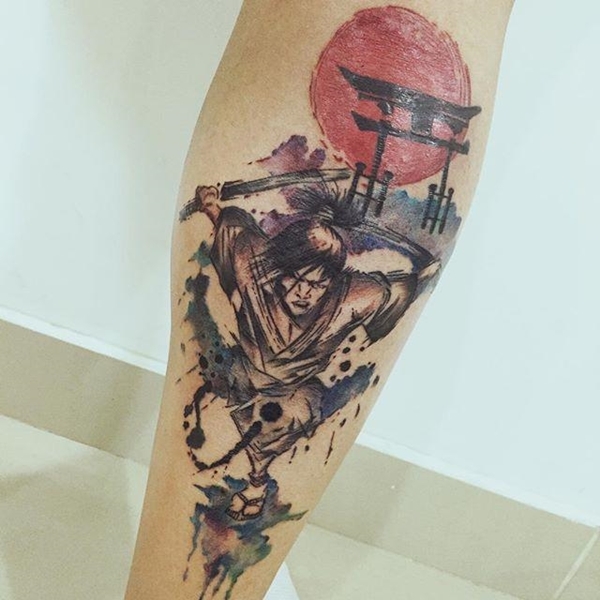 You just need to carefully consider the design of the tattoo, along with its true symbolic meaning as it involves a great deal of pain and courage to have such type of tattoo designs.